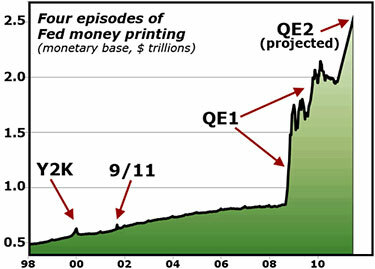 Bernanke’s QE2 will rival all past QEs and will build upon past efforts to inflate the money supply. In fact, QE2 will destroy employment. It will create new asset bubbles that will rival the old ones. Creating funny money out of thin air will exacerbate the problem, says Marc Faber. “The cause of the crisis is excessive monetary growth leading to excessive debt growth, to the Nasdaq bubble, to the housing bubble,” Faber told CNBC last week. In late October, Faber said anything less than a trillion dollars in new money will disappoint the markets and may trigger a correction in U.S. stocks, which could result in more quantitative easing. In September, Bob Chapman of the International Forecaster wrote that QE2 interventionism will be effective for the short term. But will again on the long-term drive out real investment. “The policies being put in place by the Fed are the antithesis of a free market not only because they interfere with a natural process, but also because they are borne of debt created out of thin air — debt that will have to be repaid by the taxpayer. Much of the funding being created by the Fed will and has been used to fund the debts of the Treasury and government agencies, which produce nothing but more debt,” writes Chapman. The video below explains why QE2 will not do what the Fed says it will. The only problem with the video is that it claims Bernanke and the Fed are inept bunglers. The Federal Reserve was established precisely to scientifically create depressions and destroy economies. QE2 is one of the most ambitious efforts to destroy the economy to date.